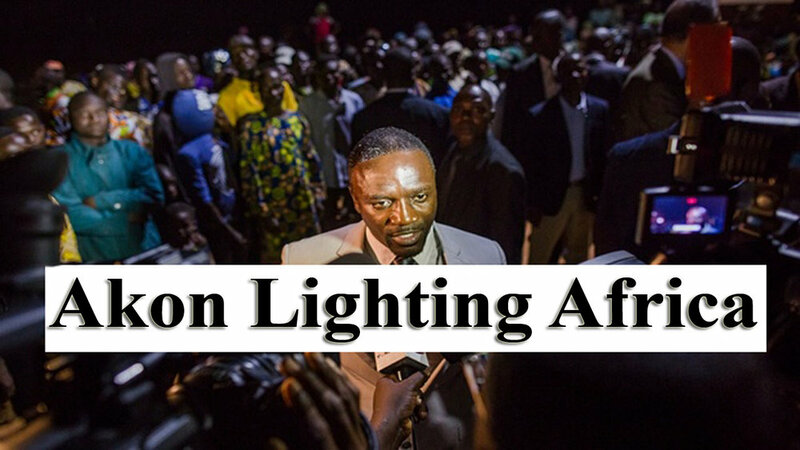 Akon and Thione Niang, the co-founders of Akon Lighting Africa with Samba Bathily, both grew up in Kaolack, Senegal, a town without electricity. It is their childhood memories and personal experience of a “life without light” that fuels their commitment to lighting Africa. The two began discussing what they could do to actively help drive Africa’s transformation in September 2013 in Washington DC. A few weeks later, they agreed that the top priority was to invest in energy, particularly in rural and semi-urban areas, because this was the essential foundation for everything else – education, health and economic development. Their plan came to life once they were joined by Samba Bathily, an entrepreneur from Mali specializing in solar energy. Not only did he share Akon and Thione Niang’s beliefs, he was also able to provide targeted solutions through his company, Solektra INT. By combining their networks and international experience and expertise, the three men launched this ambitious project in February 2014, with a view to supporting African growth as well as the empowerment of African youth. We were privileged to speak with Bokar Ture, Chief Operating Officer, Solektra International and Director of Operations ‘Akon Lighting Africa Initiatives’ on the sidelines of the African Development Conference at Harvard Law School where he was a guest speaker and TAP a media partner. TAP: What does African Renaissance mean to you? Bokar: It means a new day for Africa, a new beginning for our people. I see it as the Harlem renaissance to use the African American parallel where you had Harlem sort of be a capital of the renewal for African American culture and great things emanating out of that. So now it’s a new age for Africa, where we’ve been through so many dark periods. Independence came and it was the beginning but by the 70’s we missed that train and now it’s the new age and I feel that Africa should be transformed and my hope is that this time we seize our opportunity to be transformed. TAP: In terms of the whole Africa rising, African renaissance narrative; why is Energy so important to drive Africa forward. Bokar: Energy is essential; it’s going to be the bedrock of our transformation in the sense that you need power to have industries running. Not only industries but also for job creation and for development in general. Energy is one of the key infrastructures that we must continue to develop. So we just can’t get where we want to get, we can’t have an African renaissance without fixing this energy issue, it’s fundamental because you cannot have meaningful development without energy. TAP: France, a country of 65 million people, generates four times more electricity that of the whole sub-Saharan Africa! Bokar: Yea here we are in Massachusetts; Massachusetts has 13000 megawatts of energy available and that’s just a small state! Nigeria, which with its 175 million people, I don’t know how many times bigger, has only 5000megawatts! And that’s Africa’s most populous nation. So you see that there’s a huge gap that has to be filled. TAP: So how do we fix this? Who are you looking to work/partner with and is there a role for average person? Bokar: It’s a huge challenge for us, we are working with a number of companies that can give us good quality but also affordable products. We work with a lot of people and companies. There are many companies that are involved and many NGO’s and donor companies that have always been involved in this space to help increase access to electricity. We are working in not only PPP (Public Private Partnership) but we are also working in PPPP (Public Private and People Partnership) so we are working with communities, we are training them, we are teaching them how to install the assets themselves, they are also doing maintenance work thus we are putting jobs on the ground and creating capacity. When it comes to solar energy, we launched a solar academy in Bamako this past December where engineers can come and learn whatever there is to learn about solar electricity. We want to light up the whole of Africa. We want to help push this African Renaissance by being able to provide basic services for Africans. We want to help fellow Africans to generate more income through lighting. So if you have a shopkeeper that wants to expand but is limited by nighttime hours because he can’t have light, we want to solve this problem for him/her. TAP: What are the key challenges that you face in your role as the Director of operation? Bokar: I think the key challenge that I’m facing in my operations role is getting people to understand the importance of maintenance and the fact that you also have to spend on maintenance. I know in many parts of Africa people just see infrastructure as just an asset but the cost and capacity that goes along with maintaining that infrastructure just isn’t there. With solar panels, you have to clean them; you have to change batteries and some fundamental components. This is one of the challenges that we are facing and then obviously the lacking capacity. Right now the demand is not as high as it is needed in terms of solar panels for us to start manufacturing in Africa but I think we need to get to that point and for us to get to that point, we also need to grow the internal capacity, for us to have these plants which in some cases are highly technical. TAP: While still on challenges, outside of energy, what do you think are three of the challenges facing Africa today? Bokar: Outside of electricity, I think we need greater leadership, a vision and unity. TAP: Talking about vision, what is ALA vision, when will all Africans have access to electricity? What is your dream? Bokar: That’s it right there! We want to light up the whole of Africa. We want to help push this African Renaissance by being able to provide basic services for Africans. We want to help fellow Africans to generate more income through lighting. So if you have a shopkeeper that wants to expand but is limited by nighttime hours because he can’t have light, we want to solve this problem for him/her. We want to help these sorts of people solve problems and gain greater income that in return they can use to feed their children, put children through a better school, clinics, etc. This is how we want to contribute to Africa’s Renaissance. TAP: Since you are the operations manager, what sort of opportunities do you see coming along for African entrepreneurs that they can take advantage of? Installation, supplies? Bokar: Great question, maintenance is going to be big, maybe not now but going forward as the demand starts growing. Opportunities will also exist in manufacturing and to build plants. But at this point right now, what really needs to happen is just to grow a greater “know how” and understanding of this industry. And it’s not just solar, we focus in solar but we are open to other energy sources, we work in solar but every energy source is accepted; be it hydro, even gas to a certain extent as long as it’s done in a very clean way although Africa doesn’t pollute much. We are not close to the pollution that’s generated by single countries like the US or China. But now that we are going to go through our industrialization stage, I think in the next 20-30 years it’s definitely something that we have to look at and make sure that we don’t contribute too much too as it disproportionally affects us, climate change has given us a very large share of bad luck. So opportunities for African entrepreneurs in this field are endless. TAP: On to different topics now, by the end of this century, one in four people will live in Africa. What is your hope? How do you see that? TAP: What sort of advise do you give to a young African graduate? In Africa, 90% of people that graduate from African universities do not find a job! How do they create something for themselves and become as successful as you have? Bokar: Well thank you! I think that people like ourselves are blessed to have had certain privileges that are not given to just anyone but my advice has always been to try and fight through challenges. I think that some people sometimes are stuck and think of other choices like immigrating to the US, no! There are so many cases of people who succeed in Africa through hard work, innovation and so forth. And generally, when they make it there, they do much better than one can ever expect and a lot of times even better than me or anyone else whose gone out there and gotten degrees from a number of universities, because the real opportunities are in Africa. If you look at the number of entrepreneurs that Africa is producing now, the quality of entrepreneurs, they should take example from that. It’s doable. But nothing good comes easy. TAP: Most nations on the continent have been independent for the last 50 years. One of your visions is unity. What does Pan-Africanism mean to you and how do you see us achieving your vision of Pan-Africanism?